It's not a long drive, nor is it a particularly hard drive. For the most part it is empty and beautiful. Topping off the gas tank in Milford, UT I folded up the sun visor and stared straight into the setting sun. Heading NNW on Highway 21 I knew I had started way, way later than I should. Highway 21 like Highway 50 is very infrequently traveled and during the night it is avoided due to the open range of cattle and sheep in the upcoming valleys. The sun had set but the lingering twilight made it difficult to see. Lights didn't quite pick out things and there wasn't quite enough natural light to feel confident you wouldn't miss an animal on the road. I had already slowed down and honked at sheep, cattle and a lone antelope. Over the summits my speed would drop to 50 mph. But as the twilight faded I kept my speed low to allow reaction time. The ranchers have gotten better with the introduction of reflector ear tags; but when a 2 thousand pound black angus is in the middle of the road with its head down you don't see it at all. Before the night was over I would stand on my breaks 3 times for narrow misses and one love tap to a baby calf's rear end. The slowness of the drive and the intense concentration left me tired when I arrived at Baker Campground. Pulling through the campground I was extremely disappointed not to find a space. On my last visit 3 years ago, I had the run of the place. I circled around and headed back down. I chose Baker campground because it's out of the way. I didn't even bother with checking out the Leaman Campground as they are more popular and small. On my way down the mountain I spotted a turn out for an information board featuring ranching in the area. With it's large wide parking area I pulled in and went to bed. The trailer was slanted and leaning to one side, I fell asleep without extending the slide. I slept reasonably well and upon arising I expected the lot to have several cars along with me who couldn't find a spot. I opened the trailer door and was awe struck by the view. I had the lot to myself and marveled at the surrounding vista's. Choosing not to extend the slide I grabbed a bowl of cereal and camp chair to enjoy breakfast with the surrounding peaks. Watching several cars and trailers move down the road early I decided to make another loop through the campground to see if I could get a camping spot early. If not I would head to the trailhead with trailer in tow. 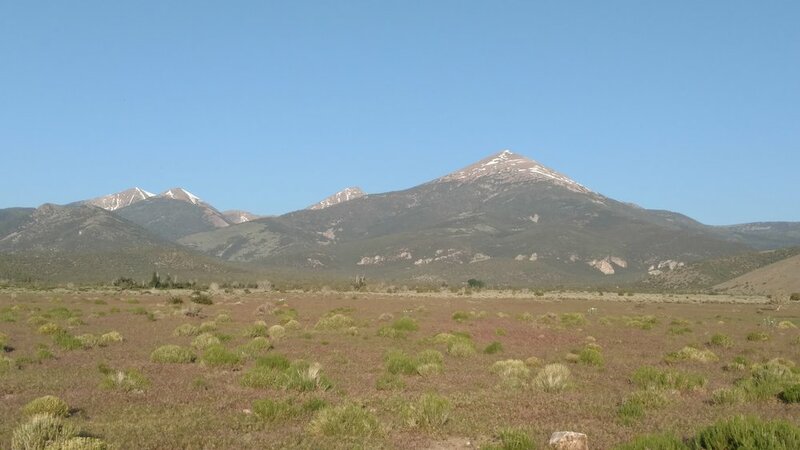 I had planned to climb Pyramid Peak (above picture left) and another sub peak in the area but the trailer has added another dimension to my hiking and if I miss getting a camping space this afternoon I'll probably head home. With still no campsites available, I decide to spend a few hours hiking toward Baker Lake. The trailhead is only 1/2 mile from Baker Campground and I park in front of the 8,000 feet elevation sign. Great Basin National Park "used" to be known as the least visited park in the National Park system, but that has not been my experience today. A dozen cars greet me in this little known, out of the way, trailhead. Baker Lake is 5.5 miles from the trailhead, one way. Ten miles on any given day is a good hike for me (I'm used to short but steep climbs). Add in 8-10,000 feet of elevation and I make the decision early to only hike part way. The air is crisp and warm. No jacket required as I make my way up the trail. Gaining elevation quickly as the trail switchbacks it's way up a wash between Pyramid Peak and Baker Peak. 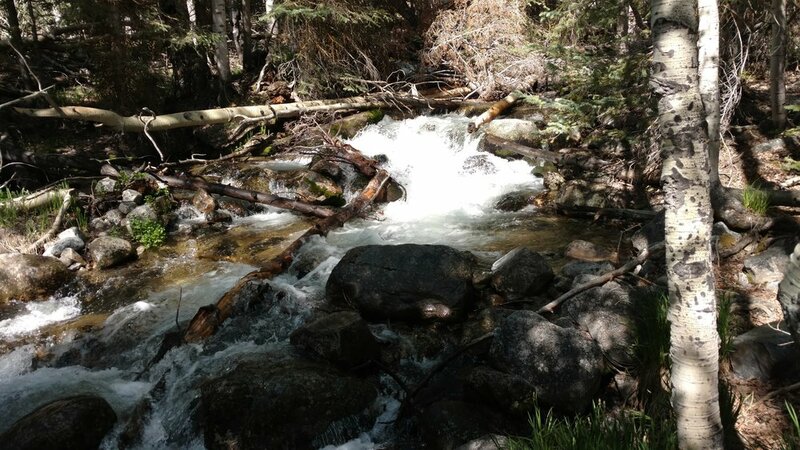 There is substantial water flowing down the stream as the visible snow on these stunning summits continue to melt. I am already feeling the elevation and lack of sleep as I stop for my first break. A fallen log rests besides a waterfall and the play of shadow and light on the water is mesmerizing. I take a seat on the fallen log to enjoy the view. I've been hiking an hour and gained close to 1,000 vertical feet. The trail is steep but well laid out as it moves between meadows and stream. I reach the junction of the Johnson Lake trail. This is the connector trail if you decide to make a loop out of the hike. I'm not sure what the total loop mileage would be but it is likely a backpack with overnight stay at Baker Lake. The trail becomes a pure Alpine experience as the desert shrubs and cacti give way to flowers and grass. Marshy areas and small streams dot the hillside with stepping stones or wooden bridges provided for crossing. I marvel at how well maintained the park trail is. Signage is critical to a good hike in an unknown area (I should say the expectation of signage on a maintained trail vs. route finding in the backcountry) and the sign posts are accurate and timely as I stop at the second sign indicating I have come 3 miles. I eat more snacks and decide this is a good turn around point. The downhill walking is nice and I stop to visit with a couple from Salt Lake Valley. They are planning on completing the loop and have backpacking gear. In our discussion they too commented on how busy the park is for a non-holiday weekend. They are the first people I have seen all morning but I soon pass a 5 person backpacking group and I am passed by a twosome. I arrive just after noon back at Baker Campground and although no pull-through trailer sites are available I managed to park in site 6. Paying up for two nights I hope to re-climb Mount Wheeler and make my first ascent of Bald Mountain tomorrow. More than a few hours are left to the day, so I decide to visit Lehmans Cave. Unfortunately the remaining tours are sold out for the day. I do look forward to the clear sky and no moon tonight. Great Basin has some of the darkest nights and I get just a glimpse of the Milky Way before dropping into bed. Bugs permitting I hope to lay out on the picnic table and watch the night sky tomorrow.